I just watched a video from the USA, wherein two men were shooting at hogs from a helicopter using semi-automatic rifles. I lost track of how many hogs they killed - they killed them all. To me hunting should be done for food, in a manner which is sporting so that the animal has a chance to get away. 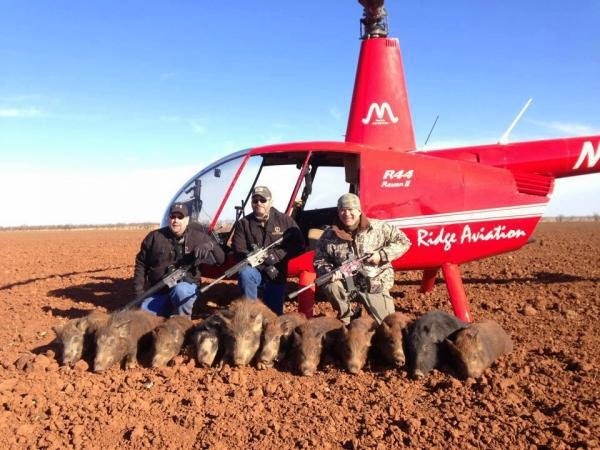 The hogs - which are reportedly causing a lot of crop damage in Texas, a region of the USA which has no wolves apparently due to over-hunting of wolves in the past - don't even stand a chance against two men in a helicopter shooting at them with rifles. No chance at all. Some of the videos on this topic have the hunters using machine guns instead of rifles. Complete overkill. Now, don't get me wrong, I am pro-hunter - but I firmly believe people should be eating what they kill. And I also believe the manner in which the animals are hunted should give the animal a chance for them to get away. What also disgusts me is the choice of words used by the "hunters" in the videos. They refer to it as a "skirmish", as if it is a war and the hogs somehow have a chance of fighting back against the men in the helicopter. They also referred to it as an extermination, which is at least accurate. The men are not hunting, they are exterminating. Bowhunting in a helicopter I suppose would at least be sporting - because the target is moving, and you're in a moving vehicle, and with archery there is much more of a challenge than there is with a machine gun. To be honest hoghunting in the USA isn't much of a challenge anyway. The hogs aren't even afraid of humans. You can walk right up to them and they will eat out of your hand (and possibly eat your hand too). They are completely unafraid. So to me hoghunting is completely without a challenge anyway. It is just a slaughter. At least with boars (the really big ones) they attack back. Nothing like a rampaging boar coming straight at you. Hoghunting in Texas is being promoted like crazy right now - advertised as "Free Hog Hunting in Texas" with vacation packages for hunters. Apparently the hogs are such a nuisance and cause so much crop damage the government of Texas is basically looking for anyone to come to Texas and shoot as many Texan hogs as they can. Some places will even provide the rifles and shotguns with the vacation package, all food and drinks included, it is a bit ridiculous all the extras they are offering. Apparently Texas is really desperate to get rid of the hogs. Here in Hogtown (Toronto) we don't have any wild hogs at all. Which is funny in a way.